OSWEGO, NY – Recently several Oswego High School art students were recognized for their outstanding effort by receiving a Gold Key, Silver Key or honorable mentions in the Central New York Scholastic Art competition. However, it isn’t often that an Oswego Middle School student gains recognition in this elite program. Kayla Volkomer, an Oswego Middle School eighth grader, was recently recognized for her talent in the Central New York Scholastic Art competition. 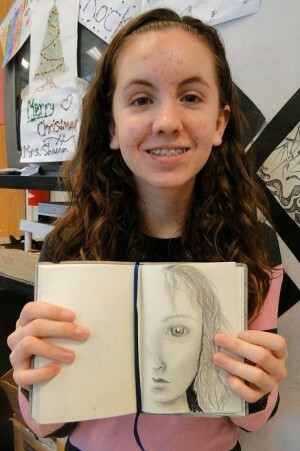 She provides a look at her talent by displaying a piece from her sketch book. Scholastic Art judges awarded eighth grader Kayla Volkomer an honorable mention award. Scratch art is quite different from painting or other types of drawing. The veteran teacher explained the importance of being recognized in the elite competition. What started out as a class project for an Oswego Middle School eighth grader became recognized in the top art competition in Central New York.